Two friends. Two completely different personalities. One breakup. Friends for sixteen years, Bess and Maxine have only had each other. As they come through the millennium unscathed, Bess's hangover lingers as she reevaluates her life and the part her control freak friend, Maxine plays in it. I’ve had a few toxic best friends in my past so I could relate to many aspects of Six Weeks to Toxic, but did find it difficult to read at times. It seemed very wordy making it tough to read, especially as I read mostly at night which made it even more difficult. I found the characterizations interesting and their relationship questionable and found the concept of a chick lit book not centered on finding a man refreshing. Unfortunately the ending seemed anti-climactic to me. I knew from the title and description of the book that it was about a break up between two best friends so I kept expecting a huge outburst at some point which I suppose sort of came at the end, but it just seemed, well, anti-climactic. After having finished the book, I thought it might have been the point to have things go the way they did (sorry, not trying to ruin the ending here) because of their personalities, especially Bess’s who seems to tip toe around Maxi. And, how do relationships between best friends normally end? This had me questioning many of my past relationships and I concluded that the gradual decent was appropriate as some of my toxic relationships ended similarly. And I think I've said far too much now! I enjoyed the Toronto details of course and thought that Bess’s career as a sound artist in the movie industry was interesting and the details were just enough to be informative without being overbearing and it was a nice change of pace for a chick lit novel. I quite liked some of the other characters and although I didn’t like him in the beginning, Bess’s love interest grew on me quickly. I will definitely read Louisa McCormack’s next novel ‘The Catch’ at some point! 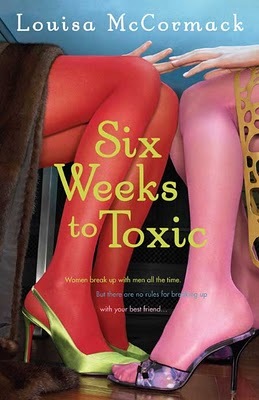 Unfortunately, I was disappointed with Six Weeks to Toxic. The whole time I was reading it I was waiting for something to happen. I would expect that there would be a definite moment when, as the reader, you would be able to see that things were going irrevocably wrong? The women are clearly very different but I didn’t really get a sense of either one of them, at least not enough to relate to them. The writing style was quite choppy, lots of description with too many similes and metaphors. Sometimes I found this interesting (at one point moving your cold hands in your pockets is likened to ones fingers conducting a symphony for warmth) but it mostly cut into the story making it tough to read. The main problem for me was that although I sort of liked the main storyteller, Bess, I really had no idea what she got out of her relationship with Maxi. Maxi was quite prickly! I eventually liked some of the supporting characters (like Bess’ parents and the dog) but if you can’t relate to the main people then the whole thing sort of falls apart. It’s possible that writing about friendship between women is a harder thing to tackle than a romantic story? All in all I liked the idea but felt disappointed by the lack of connection.